Led Zeppelin was at the peak of its powers on July 27-29 1973 when the band’s performances at New York’s Madison Square Garden were recorded for the concert film, The Song Remains The Same. The soundtrack to the film, produced by Jimmy Page, was originally released on Swan Song in 1976. The band continues revisiting their live canon on September 7 with a new edition of the soundtrack to The Song Remains The Same that features newly remastered audio. This release follows the recent reissue of their live album How The West Was Won, and rounds out the deluxe reissue series of their classic albums that began in 2014, building to the band’s 50th anniversary celebration slated to commence later this year. Coincidentally, John Bonham, John Paul Jones, Jimmy Page, and Robert Plant played their first live show together, under the moniker “The New Yardbirds” at the time, on September 7, 1968. The Song Remains The Same will be released in multiple formats from Atlantic/Swan Song, including the full album’s debut in hi-res 5.1 surround sound on Blu-ray. The Super Deluxe Boxed Set will be the most exquisite and elaborate release in the reissue series, recreating the intricate embossing of the set’s original issue and will also mark the first time the full length film and soundtrack have been available in the same package. On the 4-LP set, Page made a change to the track sequence, allowing the epic, 29-minute version of “Dazed And Confused” to be featuring in its entirety on one side of vinyl for the first time. 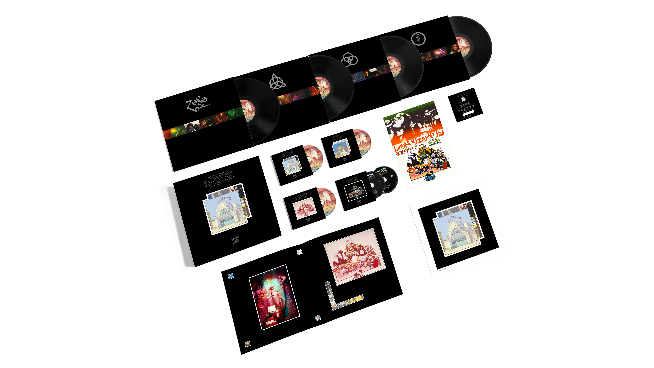 In honor of the remastered version of the album, we’ll be doing a one hour Led Zeppelin special on September 15th from 9-10pm. Join Sloan that evening and listen to the newly remastered tracks.